You can terminate traffic in Romania is possible and make good money, if you apply a competent approach to the protection of SIM-cards from the antifraud systems. However, to get stable high returns, you need to have a reliable Internet connection to terminate international calls. There is a well-developed market for Internet services in Romania, with more than 15 million connections. Broadband internet access has been available in the country since 2000, and today the coverage is 87%. As of 2015, Romania took the 10th place in terms of the level of development of the Internet in the world and first in Europe. At that time the peak download speed was up to 73.6 megabits per second, and in 2013 the city of Timisoara provided the highest rate speed to transmit internet data (89.91 Mb/s). Currently, the average rate of broadband Internet access in Romania is 100 megabits per second. It is a very high rate, which allows the owner of gsm routers and GSM gateways to place multichannel VoIP equipment and successfully terminate calls in Romania. The speed of 100Mbps is available in almost all major cities of the country such as Bucharest, for example. In other settlements the data transmission speed is about 30 Mbps. This is an excellent performance, considering that the required speed for normal operation of a gateway channel varies from 42 kilobits per second. Connecting to the internet costs 15-20 euros per month. Boost your business profits in the GSM termination by ordering the GoAntiFraud Corporate Solution from! Choose the best package - Start Up, DeLuxe or Ultimate, and get the best opportunity to evaluate all the possibilities of the service! You can also buy GoIP, EjoinTech & ChinaSkyline equipment at low prices. More than 1,300 ISPs operate in Romania. Mostly, services of so-called micro-ISPs, whose client base includes 50-3,000 users, are popular. Romanian telecommunication companies offer wireless and cable internet access, as well as DialUP technology, ADSL, LET, FTTP, and 4G. 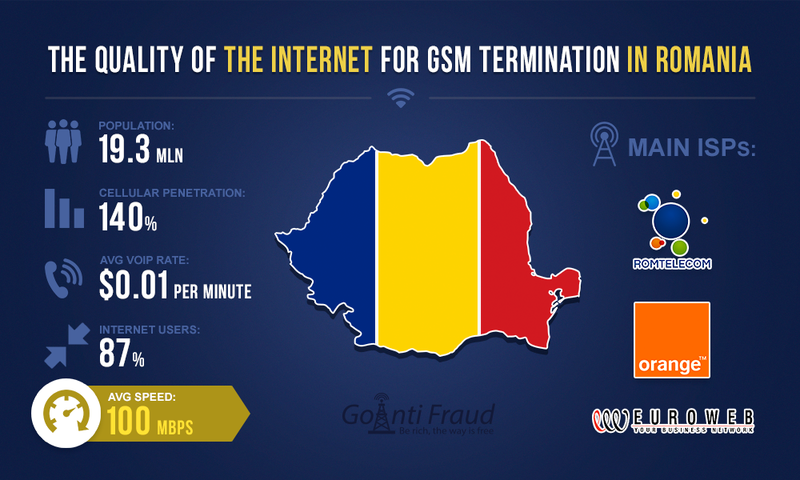 If you place equipment for termination in Romania, you can get a stable $100 income via a single channel by connecting to high-speed Internet. Thanks to the excellent quality of the Internet connection, you can use multichannel GSM gateways to increase your profits. The main thing is to reliably protect the cards from the analytical and calling systems, sim detectors that block numbers involved in traffic termination.